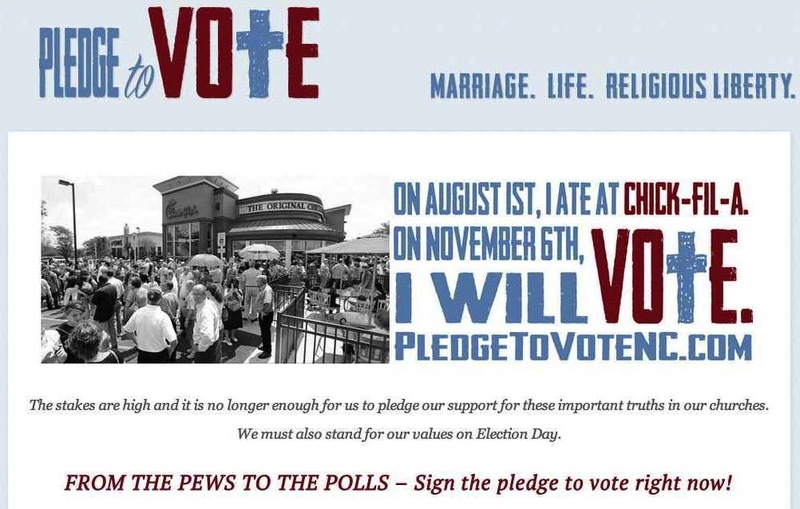 Tami Fitzgerald's anti-LGBT organization, NC Values Coalition, has a new get-out-the-vote campaign. The slogan of the campaign is "Pledge to Vote: From the Pews to the Polls." It appears that Fitzgerald & co. want to capitalize on the overwhelming support for a certain anti-gay chicken sandwich establishment. The latest NC Values Coalition email follows closely on the heels of Fitzgerald's bizarre assertion that Equality NC's most recent campaign video depicting an anti-LGBT gun owner repeatedly shooting a pro-equality yard sign was "a thinly-veiled threat against supporters of traditional marriage and can have no other purpose than to incite hatred."